Have you ever wondered what sugar is? Sugar (sucrose) is everywhere, from your breakfast cereal to the cells in your body and has more to offer than simply sweetening your morning brew. From cinder toffee to novel materials, chances are, sugar is an essential ingredient. 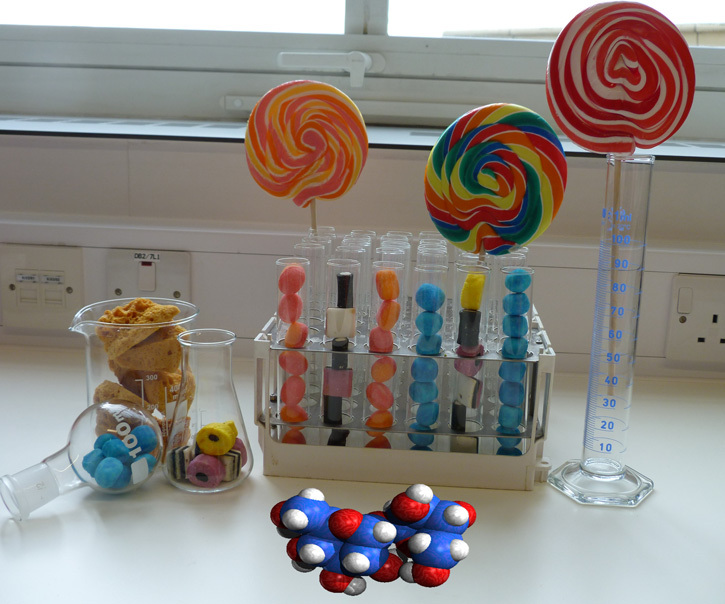 1.In the main image you can see a range of common laboratory glassware (beaker, round-bottomed flask, conical flask, measuring cylinder and some large test tubes) along with lots of different sweets and a molecule of sucrose. The glassware is commonly used to measure out and hold various liquids and solids in the laboratory, and the round-bottomed flask can be used as a reaction vessel. 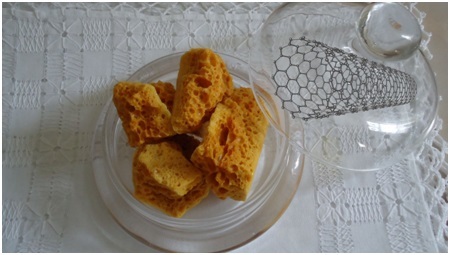 The sweets include cinder toffee (also known as hokey pokey or honeycomb) for which you can find a recipe below. We were very sad at the end of this photo shoot, because all the sweets had to be thrown away after spending time in the laboratory, just in case they had become contaminated. Sugar has been produced and consumed by humans since ancient times, but the first historical reference is found in Chinese manuscripts from 800 BC which refer to sugar production in the Indian subcontinent. (M. Van der Veen. Consumption, Trade & Innovation. 2011.) 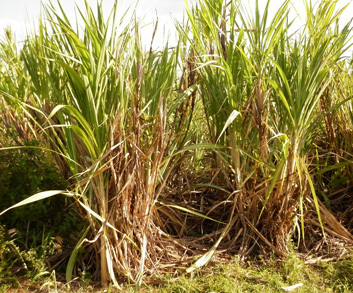 Initially, sugar came from sugar cane, a family of grasses of the genus Saccharum, which grows in tropical and subtropical climates, and the cane was chewed raw for its sweet juice. Later, a method to refine this into granulated crystals was developed, around 350 AD. The wealth generated by this ‘white gold’ transformed the appearance of the port of Bristol, home to Picture It… Chemistry. Between 1698 and 1807, over 2100 ships set sail from the city on slavery-related voyages, and they often brought back sugar, rum and tobacco to Bristol. Sugar canes grown in Veracruz, Mexico. In our kitchen “lab” we decided to make a crunchy caramel sweet – like those often found in shops. 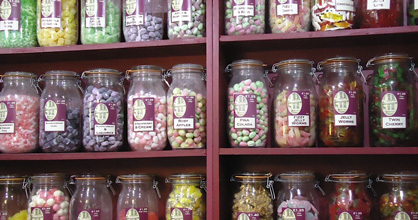 Different sweets lined up in the Bath sweet shop (important field research). Please be very careful – sugar gets very hot and can cause burns, especially because it is very sticky. Put the sugar and maple syrup in a stainless steel pan and heat whilst stirring continuously until all the sugar has melted. You should see a golden colour and smell a buttery aroma when all the sugar has melted. Carefully but steadily add the bicarbonate and pour the whole mixture on a non-stick baking sheet. Mix well and cool. Beaker, round-bottomed flask and a large test tube clamped to a retort stand, together with sugary sweets and a molecule of sucrose. 2. In science, we classify sugars as compounds called carbohydrates, of which there are many types. Carbohydrates have the same hydrogen to oxygen ratio as water, i.e. 2:1, and most have a molecular formula Cm(H2O)n, although there are exceptions. The sugar you add to your cup of tea is called sucrose, and it has the formula C12H22O11. Sucrose is a so-called disaccharide, made up of two different units called saccharides (another name for carbohydrates, derived from the greek word for sugar), one of which is glucose, C6H12O6. The other saccharide present is fructose (again C6H12O6), which is also found on its own in fruit. These two types of sugar are connected by a glycosidic bond as indicated in Scheme 1. While average bond energies would suggest that C-O bonds are as strong as C-C bonds (see table of bond energies, around 80 kcal/mol and > 330 kJ/mol), the glycosidic bond is likely to be much weaker (around 7 kcal/mol, 29 kJ/mol, see glycosidic bond strength and other reactions), allowing the monosaccarides to be released. Firstly, the thermal decomposition of sugars, and this process is called pyrolysis, which occurs when organic matter is exposed to heat in the absence of oxygen. 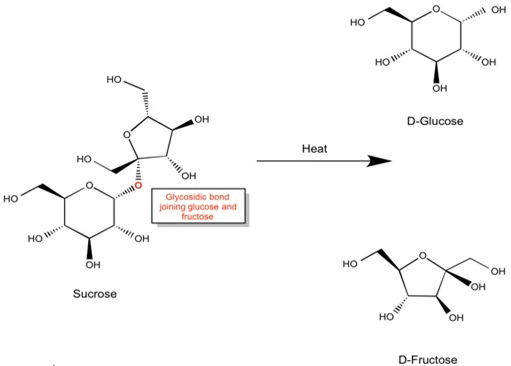 As the sugar is heated, the sucrose breaks down into its component units, breaking the glycosidic bond which joins fructose and glucose units (Scheme 1). Heating can also lead to isomerisation and polymerisation reactions, and the chemical reactions occuring during caramelisation are not fully understood. Many of these bubbles get trapped, giving the sweet produced a porous structure (and reducing the chances of chipping your tooth when you eat it. 3. 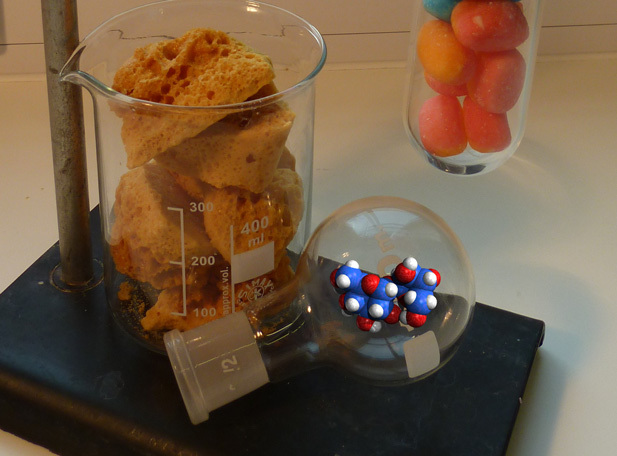 Sugar decomposition has also been investigated with the intention of creating novel materials with valuable properties. Sucrose has been used to provide a carbon source to produce porous structures called carbon nanotubes (CNT’s) which have a similar, if more ordered, perforated structure to the toffee we created in our kitchen. Because of their useful physical and chemical properties, such as electrical conductivity, strength, ability to bind to different molecules and even provide a scaffolding for tissue growth (S.R. Shin, S.M. Jung, et al. ACS Nano 2013, 7, 2369-2380) these sugar-derived structures have potential applications in many fields, from aerospace to the electronics industry. Crunchy caramel on a petri dish, together with the molecular structure of a carbon nanotube. Categories: Chirality, Cookery, Food, Organic, sugar, Synthesis | Tags: beta vulgaris, biomass, Bristol, chemistry, chirality, cooking, food, kitchen, saccharum, science, sucrose, sugar, sugar beet, sugar cane | Permalink.